The one year anniversary of Craig’s death is fast approaching. We, as a family, wish that we could all be together and that we could share our favourite memories of times with Craig. Being all together is not possible but we plan to still share our favourite memories! So we are encouraging each other to write up a written description (or even a drawing or photo I suppose!) of our favourite times with Craig? Our intention is to print these out and share them with our families in New Zealand, Australia and the USA, on 30 September as we remember Craig on that date. It would be so nice to not just remember the good times we personally had with Craig but to share in the memories that you all have too. So if you would like to share in this please send your comments to barbara@hef.org.nz. Thankyou. Why are Sundays so hard? I don’t know. Perhaps it is because Craig loved Sundays so much. He loved to Praise and Worship God with those he loved. Craig only missed one Sunday during the 84 days (2 months and 3 weeks) – 2 months since he was diagnosed with the stage 4 Glioblastoma multiforme (GBM)), from when he first began to go numb, and that was his last Sunday – 5 days before he died. During the last month of Craig’s life he had two real bad Saturdays healthwise and Charmagne’s wedding. The Sundays after those Saturdays he made it to Church. Then the last Sunday he wanted to go but didn’t have the energy since he had not been eating much for about 15 days. Today is equivalent to the last day that Craig went to Church. Next Sunday will be the one that Craig stayed home from Church. Then the following Sunday will be the last day of the month, 30 September, the day Craig went to Glory. That day was a Friday last year but because of leap year it is a Sunday this year. Craig and I had 32 years together but all I can focus on at the moment are these last 84 days of his life. I want to focus on and be thankful for the life that I did have with Craig and not on what I am missing out on now or the last days of his life. Maybe that will come next month. These last 12 months I have felt like just half a person – half of me is missing. It is hard to imagine ever being whole again. Thankfully God has reminded me again tonight that He will have compassion on me with everlasting love. That He is my husband and Redeemer. I am whole again. Craig made his last entry in his diary 14 September 2011. I thought he would be stopping for a short time until the tumour began to get smaller and then would begin to write in it again once he was able. Even though he did have some signs that the tumour seemed to be getting smaller – he was loosing his numbness in the last places that he went numb, he only got worse. He got pneumonia and never really recovered from that. I don’t have many regrets, but one I do have is that we did not carry on with his diary – we could have had Craig dictate his diary for us for about another 8 -10 days before he lost his ability to talk. Now Craig’s writing on earth is complete. It is our job to collate it together for others to enjoy, be challenged, and be encouraged. What a hard day this was last year having to say goodbye to the Zach Smith family and the de Deugd family – our six grandchildren. But the day had some wonderful highlights. First I gave Eva, Dustie and Jackson a bath in our kitchen sink, while Craig watched from the wheel chair, – this has been a tradition for ever so long. Grandmother Genevieve (the mother of Craig’s father) bathed all her grandchildren in her kitchen sink – Genevieve and Zach and possibly Alanson were all bathed in her kitchen sink. Then Craig’s mother bathed all her grandchildren in a kitchen sink. She has bathed all our children except for Grace who she has not met yet – maybe next year if God is Willing as Craig’s mother is now in her late 80’s. She will need a lot of assistance. So I am now continuing the Smith tradition and have bathed my 6 grandchildren in a kitchen sink. I am looking forward to no 7 being born in October and carrying on the tradition with this little one. Dad came out of his morphine induced sleep at 9pm last night. We rang Zach and gathered in Dad’s room. He blessed each of his children. He even put his hand on Racheal’s head and gave her a blessing. Racheal is the mother of our adopted children. She has a wonderful relationship with Dad and Mum and refers to herself as their wayward daughter. Dad led us in prayer. Together we acknowledged God’s sovereignty and His ability to perform a miracle and take away Dad’s tumour. We asked Him to heal Dad and we also asked Him to strengthen and comfort us, lead and guide us no matter what His will is for Dad’s life: whether to take him or to leave him alive here on earth for a little bit longer. It was a beautiful family time. Craig lived for over a month longer which we were very thankful for especially because he was able to give Charmange away 2 weeks later. Craig blesses his children and grandchildren. Yesterday before the Zach Smiths left Mr Smith took his youngest grandchild and first Smith grandson in his arms for a blessing over this tiny boy’s future life and walk in the Lord. Then a blessing followed for each of Jackson’s older sisters. From the kitchen I heard him praying for their future husbands and for generations yet unborn. It is good to remember that whatever God has in store for the Smiths, His larger plan encompasses many generations far into the future. Thankyou Suzannah for taking over from Genevieve in writing up these updates. I got to bless Cheyenh, Dusti and Jackson on film before they all flew out. It was a wonderful day even though it was hard to say goodbye to Genevieve and her family in the morning and Zach and his family in the afternoon. (Genevieve here) I am so proud of my sister, Charmagne. She doesn’t has a selfish bone in her body. Her life for years past has been consumed with serving others. She has spent time with Dad and Mum, strengthening the family, helping with the younger children, learning many home maintenance and DIY skills and has spent time in the USA with my brother Zach and his family, working with them and spending time with their family and she has spent time in Australia with my family and I, investing in us, helping us to build a huge shed for our business and helping me during times of pregnancy. In all this she has built a life of purity, of pursuit of her Saviour and has had a mindframe of preparing for marriage to be a skilled help meet to the man the Lord was preparing for her. She contentedly waited for this man and yesterday that wait came to an end as she said, “I do” to becoming that man’s wife. Today is Josh and Charmagne’s wedding anniversary. Family – what a joy it is when the whole family is together. This time last year we were all together. With children in the USA and Australia it is hard for us to all get together. This time last year we had one son and his wife and 3 children in the USA and one daughter and her husband and three children in Australia. What a joy is was when we all came together on the 8th last year. It was especially wonderful to have our 16 day old grandson arrive from the USA. Craig was thrilled to get a Smith grandson as he was the last of the line from his great grandfather. Now today we have two sons in Illinois, USA – one is married with 3 children, the other is single. We have 2 daughters in Australia – both married and one has three children with another one due in October. John, who stayed with us for a couple of months, arrived on the 6th and listened to Craig reviewing Romans 1-5 for the last time. Craig also loved a visit from Ilse and her family. They came to serenade him with a Psalm, plus “Take me out to the Ball Game!” Craig was absolutely delighted. I had a phone call from Sweden a couple of nights ago. Ruby Harrold-Claesson rings me up on a regular basis. I am so blessed to have so many people caring for me and praying for me and our children. Thankyou. So a Titus 2 Evening we had. Just this evening. There were nearly 50 women and young ladies present. Each one of the married or widowed women shared a story or a lesson learned or Scripture or an exerpt from a book with Charmagne. They encouraged her to love her husband and to submit to him. It was really, really lovely. Thank you ladies for making it such a special time. This time last year the Evening Standard came around to interview Jedediah about getting his driver’s licence early. Just recently we made the decision to sell the truck and the truck run. So this is no longer an issue for us. I spoke to an old friend of the family today. He and his family are going through a VERY difficult patch just now. As I spoke to him I realised how much Dad’s tumour has to say about other areas of life. My point is that Isaiah 26v3 is true when it says, “He will keep him in perfect peace, whose mind is fixed on Him, because he trusts in Him.” No matter what you are going through, you can have peace if you trust God and fix your mind on Him. Most things in this world can be lost, but the Bible assures us that nothing will separate us from the love of Christ. We can’t lose Him! What joy! What security! What hope that must give us even through the most bitter times of loss in this world. If we don’t have Christ but find Him through the loss of something else then praise the Lord because we have gained something of infinite value. Dad was asked today about the gospel. God is in charge of all things. We are going to be called to account for every careless word we utter. On judgement day we are going to be declared guilty. It is not going to be a pretty sight. God understands that we are in a tight spot. He has sent His Son to take our punishment. In exchange we get His righteousness. It is a good deal. The best bargain out. Today is Grace’s 7 birthday. Her birth father came up to help celebrate it. 2. ALWAYS having devotions after breakfast, lunch and dinner with Scripture reading, discussion, singing, Scripture memory and prayer. 5. His humility before and love of his Saviour. Dad knew he was a sinner. He knew he was forgiven. I was privileged at times to observe him humbly repent of sin before God and occasionally to ask forgiveness from other people. 7. For always being a learner. He had never “arrived” but was always growing and learning. 9. For being a reader and his admonitions to me to forsake light reading and fiction for biographies and histories. 10. For one of his and Mum’s mottos that they would put their time, money and resources into things that other people can’t or wouldn’t. It influenced them for taking up the fight to preserve section 59 to putting their money towards things like Roger Dahlberg’s work with orphans in the Phillipines (where 100% of the donation goes to help families) instead of to groups such as World Vision. 11. For his heart sickness at the thought of Christian children being defiled in the temples of humanism known as state schools. With his dying breath I know he will be telling Christians to get their children out of these institutions and to train them up in the admonition and fear of the Lord themselves. 12. For his understanding of true Biblical discipline and his courage to fight against the statists, feminists and homosexuals who worked to amend section 59 of the Crimes Act, effectively making it illegal to apply Biblical corporal correction in the home – a sad day for New Zealand. But I sure am proud of my Dad for fighting that battle. If it is God’s will to take Dad, I’m so thankful for the legacy Dad leaves with us through his life and example. Today is Jackson’s first birthday. Was it really 12 months ago that we were praying for Jackson to hold off coming into this world until Zach arrived back from his trip out here to New Zealand? I love his name Jackson Taylor Smith. He is the son of Zachariah Dexter Smith, son of Craig Steven Smith, son of Dexter Merwyn Smith, son of William Oliver Smith, son of Alanson Wesley Smith, son of Andrew Jackson Smith (Alanson Wesley and Andrew Jackson believed on the Lord Jesus Christ and hoped to evangelise the Quilleyute Indians along the Pacific coast of the state of Washington around the village of La Push.) We named our second son Alanson Wesley Tayor Smith and now Zach has named his son Jackson Taylor Smith. John Taylor Hay was of the same generation as Alanson Wesley Smith. He was on my mother’s side of the family. My mother was a Hay before she married. While Kaitlyn and Grace were at Ukulele practice I made a visit to a Monumental Mason to get my first quote for a head stone for Craig’s grave. I guess I have been putting this job off for months. I have a few more to visit over the next couple of weeks. Kaitlyn (11) and Grace (6) are playing in the Ukelele Festival on 1st September http://centralukulelefestival.org.nz/ and they did a concert in the library with other schools that are going to be there. Read the article in the Manawatu Evening Standard and listen here. Kaitlyn is wearing a pink stripped top and she is in the first closeup shot. Grace is behind the pillar. After a few other jobs we got home in time for Kaitlyn to have a flute lesson while Jedediah and I got into our much neglected garden. We have had some fine weather over the last few weeks so I am making a bit of progress in the garden. I want to get it all fixed up so that it is ready for the Spring plantings. I do have a lot in the garden already: peas, garlic, beetroot, broccoli (my own seeds), celery, lettuce – several kinds, New Zealand spinach, spinach, silverbeat, spring onion, carrots (also my own seeds), and lots of herbs. My broccoli is not ready yet – wont be for awhile. So it was a nice surprise to come home this afternoon to find a couple of heads of organic broccoli at our back door. It reminded me of last year when people were being so generous to us. Anna was amazingly helpful. Maree, Suzannah and John gave up so much of their time to serve our family. We will never be able to repay them. 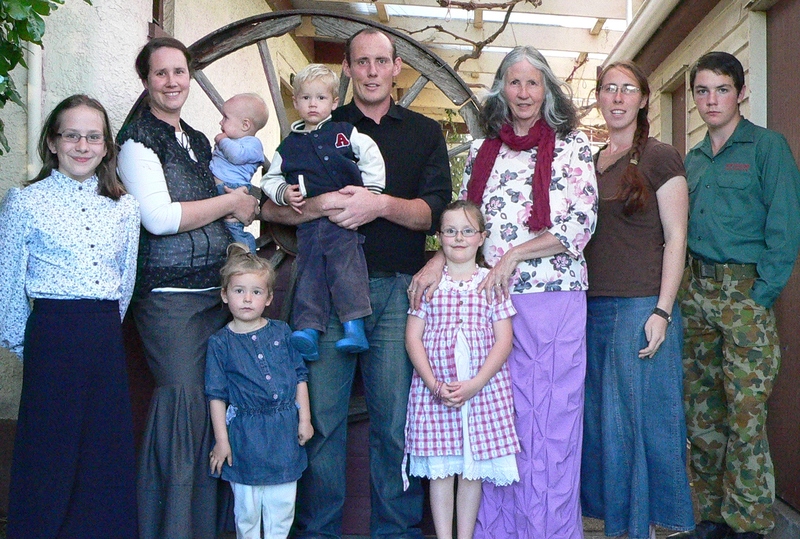 Members of our Church and the home schooling community kept blessings us every day. Thankyou seems so inadaquate. We do continue to appreciate all you did for us and for continuing to pray for us. Thankyou. Well this time last year we made a big decision. We changed Charmagne’s wedding from 22 October to 10 September – from Australia to New Zealand. Nineteen days to organise a wedding when our time was already fill looking after Craig. We didn’t send out any invitations just made it an open wedding. Unfortunately some people missed the wedding (like the birth-father of the youngest bridesmaid) thinking it was a private wedding. Apart from that it was an incredible celebration. Our Church fellowship took over a lot of the arrangements. So over the next 19 days I continued to look after Craig while many of my friends at Church and in the home schooling community planned and put those plans into action. We were sad that this decision meant that the mother of the groom would not make it to the wedding (this was the reason the wedding was going to be in Australia in the first place). I’m having a difficult time getting over the death of my Mum in March this year — I can’t imagine how it would be if my husband died. Am continuing to pray for you. I learned a hard lesson when my father died (2010), not knowing whether he was a Christian or not, a year before Craig died (2011). I always thought that I would be a cot case if my parents died not knowing Jesus Christ as their Saviour. My Dad spent a few weeks in hospital before he died. One day while walking to the hospital God put in my mind, out of nowhere, the thought “irresistable Grace”. And I thought that is it. It is not up to me to be witnessing to him. He didn’t want to hear anything from me about God anyway. It was very hard saying goodbye to him the last time because I knew at that stage that he was not a Christian. He booted us all out of his room on his last night. So we all said goodbye to him and then went into a smaller room to talk a bit before all heading in various ways. 15 hours later he died. He was forcing himself to die. He wouldn’t even let us, or later the nurses, even dampen his lips which were terribly dry. He was thinking that even the little drips of water were keeping him alive. He lived 15 more hours after we left him. It must have been terrible for him – so alone, so thirsty – lips cracking etc. Earlier I had asked God to do whatever it took for my Dad to be saved, if it was His Will. I had also asked God to keep my Dad alive until he was saved. My Mum died of cancer at 57. She became a Christian two weeks before she died – my Dad was in the room at the time. Afterwards he asked me to make a promise to him. With tears in my eyes I said that I couldn’t keep the promise not to try to convert him. But really it was not up to me, so yes, I could have made that promise. Well, I left him that last night knowing that I could not do anything, that it was all up to God.He died at the age of 84 having been alone for 15 miserable or glorious hours. I will not know until I get to Heaven myself. He did not let the nurses do anything for him – they could only turn him. They didn’t say anything to us about any change in him at all. I had to trust in the sovereignty of God. I had to work through the fact that God’s Will is perfect. If my Dad is in Heaven then Praise the Lord and if … — God’s Will is perfect. It was hard but then I learned to trust God completely. I had always thought I would be a mess if any of my family died not knowing God. But here I was with my Dad in that very situation. I learned to trust God – that His Will is perfect. Who am I to argue with God? What can I gain by arguing with God. What can I gain fighting against God. So when all this happened to Craig I was prepared in my heart for trusting God through it all. It was hard and still is hard – there are still a lot of tears. But I know that I will see Craig again. 1 John 5:11-13. I have to trust God that it was His Will and the best thing for our family, our Church and for the home schoolers of New Zealand. Craig’s death has left a huge gap in the home schooling movement here. Our lives have changed forever – we are seeing huge changes. I have had to learn to Trust God in a bunch of new areas. Life is not easy – and now we are living through Craig’s last few weeks of his life. I can’t help myself, I try not to think about it. But I can’t. I am drawn to Craig’s diary everyday and the Craig Smith health updates everyday. 7. The decrees of God are His eternal plan based on the purpose of His Will, by which, for His own glory, He has foreordained everything that happens. 11. God’s providence is His completely holy, wise, and powerful preserving and governing every creature and every action. From this I need to trust that God was in control of all that happened with Craig’s and your Mum’s treatment. It would seem that it was your mothers time to go, it was also Craig’s time to die. God was in control including the all the decisions that were being made. Sermon this morning was on James 4 – very appropriate – we must not presume to know the future “If God wills” is the right way to make predictions. And this is how I see this entire tumor scenario – If the Lord wills, I will recover, and if the Lord wills I will not recover but will probably leave this earth. I reckon I win either way! But the Lord’s will is always best and Romans 8:28 assures us it is all for our good! So whether it be disability, recovery or death, I look forward with a degree of excited anticipation. I was just reflecting on how hard last weekend was for me as I relived 4 and 5 August 2011 – our two days in Wellington and hearing the diagnosis and the hard time we had making decisions. So I decided to read Craig’s diary again. It so encouraged me. I am up to the 10th – one year ago we had all of our children around us at home. Zach had arrived (without heavily pregnant Megan, Cheyenh and Dusti) to join up with Pete, Genevieve, Natalie, Caleb and Eva, Josh and Charmagne (although not yet married), Alanson, Jeremiah, Jedediah, Kaitlyn and Grace (6). It was a wonderful week before Zach had to go back because Megan was due to have Jackson any day. Back home to the big family group– so nice to be part of. I want to say again, dear reader- seek the Lord Jesus Christ and through Him be reconciled to God- do it now! Let me tell you, when the Dr gives you months to live, you are going to want to know all about heaven and hell and how to avoid one and ensure the other- you will suddenly become acutely aware of your moral failings and inconsistencies and apologies left undone and thankyou’s left unsaid and debts owed- and a gnawing doubt about what is going to happen to you when you wake up on the other side of the grave in a very few months time. If you are not firmly secure in Christ, I reckon you’ll go into an emotional and psychological tailspin and crash and burn in quick time. Now I have not had a flicker of doubt about these things because the Lord took firm hold of my life, my heart and mind back in 1974, about April, at a Crusade in Christchurch Town Hall where Tom Skinner was the speaker- I was nailed to the wall intellectually and spiritually by the Gospel, and totally convinced about the truth of it and most importantly I understood that Christianity means you are converted into a Christ-one, Christian, belonging to Him, not to self, not to parents, not to the state. What liberty is this! Christ is boss, He, not me, calling the shots. I was certain, and have been certain ever since, that I would not make as many errors, with Him in charge. What I discovered was that when I did make errors (some would say “bad choices”; but no, these are really “moral failures” not “bad choices”, for if you know this is right and that is wrong or if you even have a doubt about something, it is a moral failure to proceed, just as the Bible says: whatever does not proceed from faith is sin- it means if you do not have the faith that the Lord’s Word on a matter is all you need to know, if you’re willing to take a chance that the “thrill” of doing this thing is worth gambling on whether it is morally wrong or not, then it means you value your life too little, the soul God gave you too little, God’s Word and His integrity is also valued too little- a real death sentence, in other words. Anyway, since that day in 1974, I’ve never had a flicker of doubt about my salvation in Him and that whatever He brings my way is best. Life has been hard at times- I’ve had to apologise a lot and make restitution where in the old days, without a Christ-sharpened conscience I would have ignored the situation and not let my indiscretion bother me. Since becoming a Christian, my indiscretions are a real pain, and I am compelled to do all I can to fix them up and also to eliminate their occurrences. So dear readers, please do get your soul saved by Christ and deal with your fate on Judgment Day now, while you can do so in peace, for should God bring you to a day of crisis, so many other considerations will be pressing upon you, you may decide to sort your possessions when you really should use the time to submit to God- so please come to Christ now! I would have been a mess if I had not had total assurance in this area when the doctors told me I had only a few months to live, as they told me just the other day, 4th and 5th August 2011. And start reading up on all the alternative health stuff too! I was so encouraged to be reminded of Craig’s solid faith and his total assurance of his salvation. He knew what would be happening to him if God was calling him home. He had complete peace about that. I am at peace too even though I do still have some hard times like last weekend. We continue to miss Craig in our lives and find that sometimes it is the little things that continue to bring tears to our eyes. We are now entering into the last 7 weeks of Craig’s life last year. Yesterday in 2011 he had his second MRI. From that we learned that his tumour (Glioblastoma Multiforme) had grown 30% in 8 days when they expect to see not much growth at all. Last year this was a particularly hard day for us as we grappled with and made some very hard decisions. On reflection we made the right decisions. Craig had a much better quality of life in his last 7 weeks than he would have had if he had had a biopsy, as the radiation, if he had had it, would not have kicked in to help him until his last days. Praise God that He led us to make the right decisions at a very difficult time and for the wonderful family time we had as a result. We were looking for answers this time last year. The CT scan had showed no tumers. But the neurologist was concerned about a black line on the scan image that was thinner on one side than the other. So he said he would order an MRI for sometime in the next few days and that it could take a week for us to get the results. Well, we got home and the hospital rang to say that we were needed back there in half and hour for the MRI. As the MRI finished and Craig was still on the table they told him that the neurologist wanted to see him the next day. At the same time a nurse came to me in the waiting room and told me that Craig needed to come back the next day to see the neurologist. We knew then that it was bad news. I wrote in here on the 29th “The Neurologist told us that Craig has a big tumor in his brain. Not the best news in the world, but as we tell all our Christian friends here, the Lord has the best sanctification programme out! Romans 8:28 and James 1:2-4. I need to keep reminding myself of this over the next 2 months. Memories are floooding back. Please pray that we will only remember the pleasant memories. Craig’s entry in his diary 8 July 2011 It was around the 8th of July 2011 that my left foot really began to bug me. It felt like my shoe had developed a pressure point on the ball area, and I imagined that walking on it as I did was causing nerve damage. Thankyou for praying for me and our family. We are very aware of your prayers for us today and everyday. It is the little things that often get me. Yesterday when I was shopping at the supermarket I went to buy something and then had to stop. That was something that Craig really liked me to buy for him. This morning in the shower, and often when I have showers, I think of Craig’s last few showers at friends. We have town supply water, our friends have rain water, so we would drive out to our friends. Those last few showers were so hard for him as he couldn’t stand alone. I had been thinking ahead over the last couple of weeks what it would be like today for us, since the little things are still getting to me. I had mentioned this to a number of you, I thankyou now for praying for us as we have a strength today that I had not anticipated. The homeschooling movement is really missing Craig as well. We have a number of issues that Craig would have competently dealth with. Single Mum children 6 and 8. Failed two reveiws and now the MoE has told her that her exemption will be revoked in two weeks. We are still waiting for the letter to arrive. Single Mum of 2 special needs children 7 and 8 having difficulty getting an exemption. All seemed to be going OK then all of a sudden things changed – seems the school is kicking up a fuss. Mother, who is a Teachers aid, failed 1st reveiw. It seems like it might be the only reveiw for her 11 year old. I am waiting to see the letter. Does anyone know of home educators failing their first ERO review then not getting a second review? I am writing to the two schools mentioned in the article. Someone from the leadership of the Nelson Home Education Association has also written to the two principals. 2. Do you know of anyone who has only had one bad review and then been recommended to the MoE that they stop home schooling? 3. For those with special needs children: What help is there out there for home schooling families? I don’t mean financial – but what organisations are available to help when there is a need? 4. Any advise is welcomed – if you would like to help in any of these cases then please let me know – thanks. It is now 9 months since Craig passed to Glory. Our lives have changed forever. We feel it every day. But we are not without hope. God has been good to us. There are still many tears and now we approach the anniversary of so many things leading up to the 30 September. It was on the 8th of July that Craig was first concerned about the numb sole of his left foot. He thought it was his boot so went out and brought new boots. I just found this on the HSLDA website. I probably read this before but I can’t remember reading it. 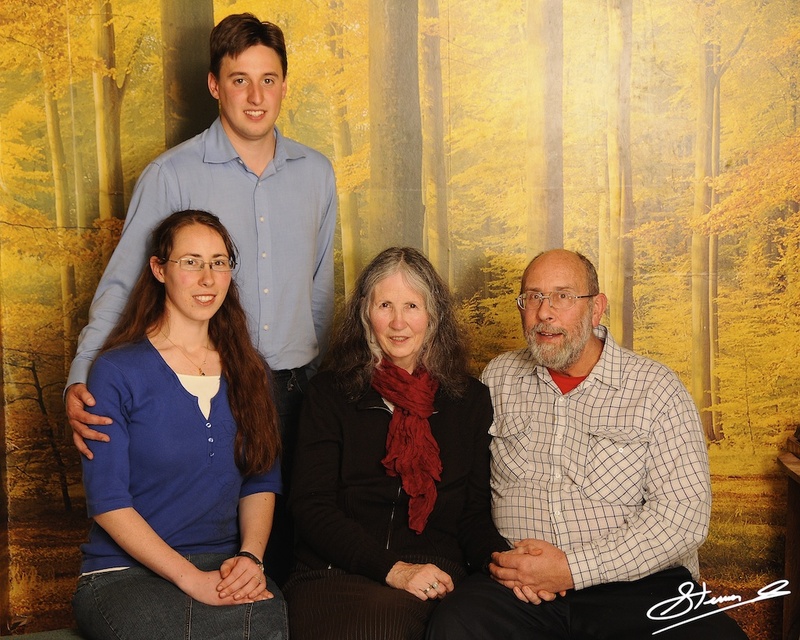 Craig Smith (Jan 26, 1951–Sept 30, 2011), together with his wife Barbara, was instrumental in the homeschooling movement in New Zealand for over 25 years. In late July 2011, Craig was diagnosed with an inoperable brain tumour. (The diary he kept during this time is available at the Home Education Foundation.) Losing his battle with cancer in late September, Craig is survived by his wife and eight children. Could I please have 10 copies of “Sanctifying our Sons and Daughters” and 1 “15 Things Every Father Must do With His Sons”. A friend loaned me these after sharing with her my desire to parent differently to the way a lot of parents even in the Church are parenting. My husband, on reading them, now has tools to parent differently which I so appreciate. I love receiving letters like this. I have sent out letters and receipts to everyone who have given donations to the Home Education Foundation during the financial year ending 31 March 2012. I still have one family to send a receipt to. They are connected to the Norvei Trust. Craig dealt with all the donations until 28 July 2011 including the one from the Norvei Trust. I don’t think he sent them a receipt. So I would love to hear from you so that I can send you a receipt. If you gave a donation to the Home Education Foundation and have not received a receipt yet then please contact me. I was a little late in getting receipts sent out this year. I was held up a bit when I got a letter at the end of last month saying that the Home Education Foundation was going to be loosing it’s charitable status in two weeks. I was horrified so quickly got on the phone to see what I should be doing. It has been a huge learning curve for me trying to figure out what Craig used to do and what is still necessary to do or what I can get others to do or cease doing. I have now filed reports and accounts for the Home Education Foundation with the Charities Commission. They have been accepted. So now I know to file these reports each year within the first six months after the end of the financial year. I am very pleased to report that the Home Education Foundation will be keeping its charitable status. This morning my wife, Daena, and I named our firstborn son. His name is Levi Andrew Craig Moore. Levi after Abolitionist Levi Coffin, the unofficial “President of the Underground Railroad,” who is estimated to have helped smuggle at least 3,000 slaves into freedom. Levi Coffin is also an ancestor of baby Levi – on Daena’s side of the family. Craig after a man who was immensely influential in my transition through God’s grace – from a “normal” self-obsessed young man into someone who better understood his mandate from God to fight for righteousness, the autonomy of the family, and to speak up for the speechless. Craig went to be with Jesus on 30 Sept, 2011. His legacy is far reaching and Levi is truly privileged to have this great man’s name in his. It is 6 months since Craig passed to Glory. Yesterday my Australian family (two daughters and 3 grandchildren) left, after a glorious week’s visit, to return to their husbands and homes. We had a wonderful time and achieved much during that time. Since my wife passed I am constantly asked how I am doing. I am so grateful for people’s concerns. The truth is I do have a long to-do list, even without my honey making me honey-do lists. I also feel the weight of the sorrow of missing her that beckons me to spend the day in bed. I can’t, however, curl up in a ball because of my life’s work. I have eight children to care for, children who miss their mom every bit as much as I do. For all my sadness over the loss of my wife, I yet have what we have made, by His grace, together, these precious children. They need their dad more than I need a day in bed. In loving, in serving them, my wounds begin to heal and I am reminded I am not a man without shoes looking at children without feet. I am instead the richest man in the world, because of the children who are my, and His heirs. Give thanks. Repent. Believe the gospel. And get to work. I am truely blessed and I do feel like I am the richest Woman in the world, because of the children who are our, and His heirs. I do give thanks. Repent. Believe the gospel and now I need to get to work. I have much to do (DV). Tomorrow is the end of the financial year. I want to get the 2 GST reports done next week. This will help me to get the end of year receipts out to all the givers to the Home Education Foundation during April. Next will come the year end accounts. Once those are out of the way I will be sending out a letter to all the subscribers to Keystone and TEACH Bulletin. Then comes a very large project I want to send a letter or email to everyone who has contacted us since July 28, 2011. In amongst all of this I want to make the home education of our three youngest the highest priority and dealing with any MoE and ERO difficult cases. I have had a number of people with difficult situations regarding the MoE and ERO and some involved the Police. As of right now all of these are resolved, although one person has another ERO review coming up really soon. Unfortunately in the early days after Craig died two people contacted me with difficulties which I didn’t follow up at the time. If you are one of those two people reading this now and you still are having difficulties then please get back in contact with me. The last six months, in some ways has gone by really fast, and in other ways it has taken a very long time. We very thankful for all the love and care people have shown to us. My family have been wonderful and really supportive. Our local Church fellowship have continued to be looking out for our needs. Folks up and down New Zealand and over in Australia have been contacting us and looking after us. And overseas we have had continual support from folk in the USA, Canada, England, Mexico, Japan, Fiji, Holland and a very special friend from Sweden has been ringing me regularly all through the time of Craig’s illness and during the last six months. Ruby rang again last night. It is wonderful to hear from her so often. I am still having people ring up and ask for Craig. Today a young man from England rang. We have never met him yet he would ring and talk with Craig every 6-8 months for a couple of hours. Craig had quite a ministry on the phone – he is being missed by many. We continue to miss Craig: to miss his laugh; to miss his Spiritual leadership in our home (although Alanson is stepping in and taking over this role); his visionary ideas; his companionship; his love and care. 33 years ago today Craig and I were married on a beautiful day at Foveran in the Hakataramea Valley. We had nearly 33 good years – some were a little tough which I have written about in our book “Training Our Children” and here but mostly they were great years. Early in our marriage Craig was challenged to do the hard things – the things that others can’t do or wont do. This characterised our marriage for nearly 33 years. We seemed to be pioneers all through our marriage. We have had a wonderful day remembering Craig. Family and friends have shared in our grief with us and rejoiced for Craig with us. Thankyou. It is now four months since Craig passed to Glory. We are continuing to miss him terribly. I missed a grandchild’s 2nd birthday today because I was reflecting too much on Craig and not enough on others around me. Tonight I have been reading R C Sproul Jnr’s blog – through tears I have been encouraged. Children, and their parents, crave stability. When their world is rocked by change, they are comforted by that which remains the same. I have been reminding my children of late that the loss of their mother, for all the pain, doesn’t mean that everything has changed. Indeed when I put my littles to bed each night I, as I have always done, remind them of these bedrock truths, “Daddy loves you. Mommy loves you. Daddy and Mommy love each other. And Jesus loves you.” These are the unchanging truths they can always count on, the solid ground on which they walk. We that are left behind are still together. And I am still me. The Bible says that husbands and wives are one flesh. Christian marriage pundits turn this too into “Be nice to each other.” That is, we are told about the importance of open communication. We are encouraged to be as concerned for our spouse as we are for ourselves. We, in rephrasing what God has said so that we might understand it, end up further from the truth. We are not commanded to live as if we were one flesh. Instead we are told that such is the actual truth. The one-flesh reality means that I haven’t just lost the love of my life, but half of me. How could I recognize me, when I am now only half the man I once was? It isn’t quite accurate to say that when she drew her last breath a part of me died. Instead, half of me died. …The truth is, by God’s grace, that I have no regrets about anything. Everyone, childhood friends, relatives, pew neighbors, ministry associates, everyone has done wonderfully by us. We are so overwhelmed with the grace of others that our biggest burden is how to adequately say, “Thank you.” In the end we know we can’t, because the very source of all the kindness we have received is the same grace by which we are redeemed. You don’t repay that. You simply weep in thanksgiving. Jesus did not, forty days ago, take Denise from me. She was never mine to begin with. He placed her under my care. He blessed me with her wisdom, with her example, with her love. But she was then what she is now, and will always be, His. Yes, God did NOT, four months ago, take Craig from me and my family. He never was mine to begin with. He placed me under his care. He blessed me with his leadership, love, wisdom, example, friendship and so much more. Craig was then what he is now, and will always be, His. …I too belong to Him. I asked Him to give me forty days to mourn- to devote time, space, energy to entering into my loss. Those forty days have drawn to a close. Crossing this barrier, stepping out of the ash-pile, however, hasn’t changed my heart. Indeed despite recognizing the objective wisdom of my friend who suggested that I give myself over to mourning for forty days, I find myself not wanting to let go. I know, as I knew from the beginning that moving past this forty days will not end my sadness. I fear, however foolishly however, that it will end her, that she will pull further away from me. I fear that I would be giving up the ghost, which seems to be all I have left of her. The dust of her death has become my familiar familiar. The irony is the matching fears. That is, in putting that ring on Denise’s finger, in that ritual pregnant with promise and meaning, I was afraid. Could I be the kind of godly husband she deserved? Would I be faithful in leading her? It is the same fear that haunts me now. Will I honor her memory by being the man she helped make? Will I be faithful to her memory, and our pledge? And the mirror of that fear is in the mirror of the ritual. On this, my fortieth day of mourning my beloved, I remove the ring she put on my finger. I cried through putting her ring on, even as I cry in taking mine off. The ring reminded me not that my life was committed to Denise, but that our lives were committed to the Lord. Its absence, I pray, will remind me still of the message inside. As for me and my house, we will serve the Lord. God called me to be a husband for almost twenty years. He has called me to be a servant, a soldier, a disciple and a friend for always. Pray that I would be faithful. And again I echo RC’s prayer “As for me and my house, we will serve the Lord. 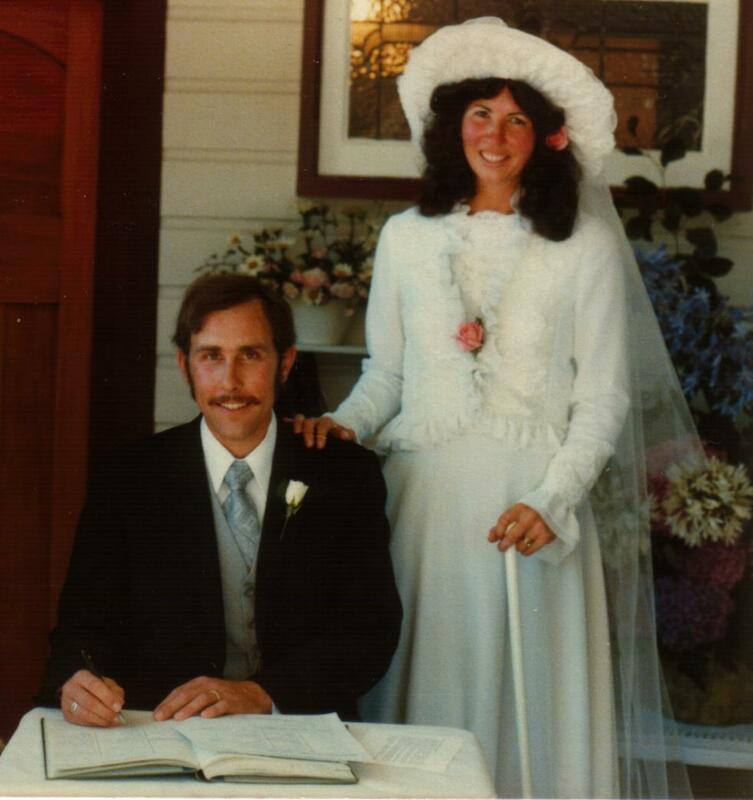 God called me to be a wife for almost thirty three years. He has called me to be a servant, a soldier, a disciple and a friend for always. Pray that I would be faithful. God’s steadfast love is better than life. Craig knows this steadfast love which is better than life now. Oh to be with Craig to experience this steadfast love and to be with Craig. God has chosen to take Craig and leave me here. Craig has gained. For me to live is Christ. The verses in Psalm 63:1-8 are a real comfort to me as I remember and meditate. He has and is being my help in the shadow of His wings I do sing for joy. My soul clings to Him; His right hand upholds me. What an encouragement the next generation is! Those who walk in purity, raise their children in the admonition of the Lord, and who are unstained by the world (James 1:27) are a blessing to behold. Indeed, this can be rare in our society today. Our family was greatly encouraged when we attended Charmagne and Joshua’s wedding. It was exciting to see a young woman whom we’d known for nearly eleven years who walks in purity and who had properly prepared to be a helpmeet to her husband. We were very blessed to be witnesses to such a union of joining a man and woman for a life’s work of service to the Lord. Attending a wedding is something we take very seriously because it means witnessing the vows that form the couple’s covenant before God. It’s not about seeing the bride’s gown—although Charmagne’s was beautiful—or feasting at the reception, it’s about celebrating the two lives joined as one and being a witness to their vows. But the blessings the Lord bestowed upon us didn’t stop there that weekend. We had the opportunity to talk with Zach and to spend time getting to know his lovely wife, Megan, and their two beautiful daughters and newborn son. Craig enjoyed his new grandson, the next generation to carry on the Smith name. “The male Smiths were getting a bit thin on the ground,” he commented to us and then gave a hearty laugh. Genevieve, her husband, Pete, and their lovely children rounded out the family portrait for the Smith children who are now married. We watched as Pete gave quick lessons to his children about respect and manners (Proverbs 22:6). It was wonderful to see a father undertaking this responsibility as Genevieve quietly nursed the baby. On Sunday afternoon, we were blessed to see the Zach Smith and Pete de Deugd families enjoying being together, not only for Zach and Genevieve’s sake, but also seeing them as the next generation raising the next generation of warriors for Christ. And, yes, we view those walking in purity and trying to raise godly children in a secular world as warriors for Christ. By God’s grace, raising godly children is a ministry in itself, which we all sometimes forget. It was very encouraging to see the fruit of how Genevieve and Zach—Megan and Pete too—were raised and that it is producing more fruit in how they are raising their children (Psalm 112:2). It was a blessing to hear these two young families talking about how they plan to homeschool their children! During a moment like this, one knows that every moment spent in prayer, sacrifice, and love that it takes to homeschool is well worth it and does bear fruit. It is by God’s grace that any parent succeeds in raising a godly child to carry the torch of Christian love and virtue to the next generation. We also witnessed the torch being passed from Craig to Alanson as future leader of the family. Alanson led us in the Smith tradition of praise and worship after the meal, something that we have always admired in their family when we’ve visited. Our family would like to thank the Smith and de Deugd families in letting us join you the day after the wedding. Time spent with your families has always blessed us immensely, but this last visit to Palmerston North was extra special. Thank you for giving our adult children the vision of seeing what they too could achieve with their future families, Lord willing. Thank you for being a part of our lives and capturing a huge piece of our hearts! We love you dearly. he enters into peace; they rest in their beds who walk in their uprightness. Once Genevieve, Zach and Charmagne and their families returned to their homes and Maree, Suzannah and John, our three extra helpers, returned to their homes Alanson moved into Charmagne’s old room after being away for about 8 years. So at home I now have Alanson 27, Jedediah 13, Kaitlyn 11 and Grace 6. The first thing I had to do was do a new exemption application (to home school) for Grace. The one that Craig and I did jointly before he was diagnosed and extra info after he was diagnosed was declined the week before Craig died. We were told we had the right to appeal that decision by writing to the Secretary for Education who’s decision is final. And I had heard Craig say often enough don’t go down that route. Since Grace was already 6 I then wrote a new more conventional exemption application based on Kaitlyn’s (which was approved in 4 days) but not Grace’s. I was again asked for more information – I needed to write a paragraph on each subject, more on assessment and more on the timetable. I think times are a changing – and we now don’t have Craig to help keep these changes to a minimum. Thankfully I now have Grace’s exemption. While Craig was battling his cancer we left everything to fight the cancer and to do things so that we would not have any regrets if Craig were to die. It was wonderful to have Craig’s sisters visit from California and Canada for a long weekend. We sure made the right decisions to bring Josh and Charmagne’s wedding forward. You can still watch it on the livesteam http://hef.org.nz/about-us/craig-smith-26151-to-30911/charmagnes-wedding/. Thank you to everyone who contributed towards the special surprise for Charmagne. Genevieve kept it from us all. What a surprise when we saw the horse and carriage coming down our street. Our good friend Roy had a struggle finding a horse and carriage for the surprise. This one came from nearly 3 hours away and the horse was still out wintering. They had less than a week to get the horse ready for the day. The horse lasted the whole day and transported the bride and the “father of the bride” to the Church and the bride and groom for their photos and to the reception. I made a decision not to leave Craig from the time of diagnosis of his unoperable, extremely fast growing Glioblastoma multiforme which I am now very thankful for as I only left him briefly twice for about an hour each time. Thank you for your support of the Home Education Foundation over the last four months. We really appreciate it. Craig stopped working on 28 July when he had his MRI and we knew that it was going to be something big by the way everyone reacted before he even got off the MRI table. We sent out a letter to all our Keystone and TEACH Bulletin subscribers informing them that we would be taking a break from producing these for the rest of this year while we sought a cure for Craig. We promised to either carry on next year or give refunds to everyone. To read Craig’s diary, read updates about Craig’s health, see Charmagne’s wedding, listen to Craig’s funeral and the tributes at the afternoon tea via Livestream, read the tributes and the one from Geoff Botkin that wasn’t read out at the afternoon tea then go to this link: http://hef.org.nz/2011/craig-smith-26-january-1951-to-30-september-2011/. I am missing Craig terribly yet God is my rock and strength as I trust in Him. Psalm 62:5-8. I know many of you are also missing Craig. I hear it from people who ring up to talk to him about their current issues. Craig will be missed by the home education movement in New Zealand for a long time. I have had to think about what I should be doing now. I have three little ones still at home. They are 13, 11 and 6, and their training and home education must come first. Alanson, our grown up son, has moved back home and has taken on many of the responsibilities with the children. Craig and I were involved jointly in the Home education Foundation and it has been so much a part of our lives for so long now. I don’t want to give it all up. Alanson being at home now will enable me to carry on some of the Home Education Foundation functions like: the website www.hef.org.nz; the email discussion groups-hefnetnz, chednetnz, ccednet, dwha and TEACH-eForum; the books we sell; difficult MoE and ERO issues (which Craig was so good at-I have a lot to learn, but have already had a couple of cases since Craig died); and a Titus 2 ministry which would include counselling-home education and family/parenting issues and speaking at a limited number of workshops each year. I have decided that I cannot keep doing Keystone or TEACH Bulletin. The Home Education Foundation trustees and I are considering two options: first that someone else does them (in which case your subscriptions will be extended out) or second that they cease being published altogether (in which case we will send out refunds). I cannot take all the phone calls from people starting out like Craig used to. He would get a number each week and he would be on the phone to them for 1-2 hours at a time. This will take up too much of my time as these usually come during the day when I now will want to be with my children. So I will be referring these calls to local support groups. I would like to get a good list on our website of the main contact people in each area to make it easier for new people. 1. The History of Home Education in New Zealand. Craig has written a bit and several people answered my call for this and sent in their view of the history in their area. If you would like to write something then please send it to me over the next few months. 2. God took Craig home when his work on earth was finished. So there will be nothing new from Craig but he does have a lot of written work on his computer that I would like to publish over the next few months. Thanks again for your support. It is greatly needed for keeping the website going and helping me to keep helping home educators in New Zealand. Serving, promoting, defending and publishing for Christian and secular home educators in NZ and overseas since 1986. I have also been trying to spend some time in our garden. My next big project is to write to everyone who contacted us from the time of Craig’s diagnosis. I want to thank each one personally who gave money to go towards Craig’s treatment and for our family since Craig died. Many people have sent us cards, books, tablets, herbs, lots of advice and websites – all this was so welcomed. We do thank God that we are in a Bible believing Church who has taught us correctly about the sovereignty of God. It has not been easy, we miss Craig as a husband and father but we are trusting in him, where we can have no understanding at the moment, to make our paths straight and He is meeting all our needs. One of the major causes of devastating grief and confusion among Christians is that our expectations are false. We do not give the subject of evil and suffering the thought it deserves until we ourselves are confronted with tragedy. If by that point our beliefs–not well thought out but deeply ingrained–are largely out of step with the God who has disclosed himself in the Bible and supremely in Jesus, then the pain from the personal tragedy may be multiplied many times over as we begin to question the very foundations of our faith – D. A. Carson, How Long, O Lord? Reflections on Suffering and Evil, p. 11. Thankyou again for labouring with us and for us in prayer. We are very aware that people are praying for us. (Update from Genevieve) It is a month since Dad’s funeral. Pete and I and our children are back in Australia. There have been a lot of bugs going round and we have managed to catch all of them. Pete has more work than we can keep up with (a real blessing) and is researching the possibility of investing in a laser scanner and CNC router to take his woodworking (www.pdwoodcraft.com) to the next level. Charmagne’s wedding gave me a chance to exchange childcare tips with Megan (Zach’s wife) and her ‘how-to-get-a-child-to-sleep-12-hours-a-night-from-the-time-they-are-seven-weeks’ tip has given us a new child in Eva. From squawky to content and happy, Eva is now a child who laughs all the time because she is getting enough sleep. Marvellous. Zach and Megan are back home with their tribe. Zach is about to celebrate his 30th birthday and they have come through Rainbow’s (very busy) catalogue season (request a catalogue at www.rainbowresource.com). Charmagne and Josh have spent two weeks in Adelaide in South Australia with Josh’s work. Friends in Tasmania are beginning to wonder whether Charmagne exists since some haven’t seen her yet since they married as they’ve been away from Tasmania so much! I got to see them three weeks ago. They were obviously VERY happy. Alanson is down at Woodbourne. He is doing his month long corporal’s course with the RNZAF. He has moved back home and (when not in Woodbourne) sits in Dad’s seat at the table. He gets the family up at 6:30am for breakfast and leads in devotions before going to work each morning. At night he reads to the children while they are doing the dishes. We are VERY proud of Alanson for taking up Dad’s mantle in the family. Mum uses the time he is at home with the children to do any office work. Otherwise her days are spent with Jedediah, Kaitlyn and Grace home educating and doing chores. They ask questions about Dad’s death. “Why couldn’t the tumour be operated on?” It is hard for them. Grace in particular often says that she misses Dad. Mum takes those opportunities to remind her, “Remember how Dad used to hold your hand and not let go? He didn’t want to leave you Gracie.” Occasionally you might find her at the table playing, “Kings in the Corners.” She will deal two hands: one for herself and one for Dad and then plays both hands. The truck run has been given to some friends until such a time as Jed acquires a license (through normal or abnormal routes). He is still in discussions with our member of parliament. I was compelled after Dad’s death to consider whether we would do things differently if we had to do it over again. We might change some things, but most things we would still do again. For example, we would still make the same changes to Dad’s diet. God was so gracious to allow Dad to be fairly comfortable and pain free during most of his time with the tumour. We think his diet played a huge part in this wellbeing. And I simply don’t know what we would have done without our doctor in the USA and the LifeOne. He has refused payment for his services which makes it very difficult to express to him how VERY, VERY grateful we are to have had his assistance during this journey. The support he gave us, the holistic care he took of Dad, the way he made himself so very accessible (we could call him anytime day or night and did) were all acts of such true charity. He spent hours consulting with us and researching on our behalf. We would most certainly want to enlist his services again. And we would want to use his LifeOne again, especially since there were signs that the LifeOne was working. But we were dealing with a very fast growing tumour and the fact is, the Lord wanted to take Dad home to be with Him. “One thing I realised while staying with your family–even though by that time she’d left–is what a rare gem Charmagne is. When I first met her we fell so easily into friendship that I didn’t really try studying her hard to see what made her so easy to get along with. When I got home from NZ, Mum mentioned that she “has something few women have…She’s gracious.” That and observing Charmagne’s behaviour with her siblings especially through some hard times challenged me to be more gracious in everyday life. “Another thing is totally unforgettable. The way your family grieved in the hours and days immediately following your father’s death was incredibly inspiring. I was surprised that the whole family, even the little girls, were gathered into the bedroom without any superstitious or over-nice worries about the body. Your mother told Kaitlyn that she wanted her to weep–“now is the time to grieve”. But hardly a word was uttered about sorrow and loss in all those prayers. Did you know that the following Sunday, at church, a man told your mother that her face was shining? When she told me about it, in surprise, I had to admit I could see why he’d said it. I now know what grief looks like when it gives glory to God. I feel so privileged to have been there at that time to see it. “I learned to appreciate a lot of things. Like the health that I and my family enjoy, for one thing! Mum and I have found that our grief at Dad’s death has only gotten more intense in the past 1.5 months. Something will pop into your mind that you want to ask Dad only to think, “Oh, I can’t.” Or there comes the realization, “I’ll never see him again here on earth.” The reality of death seems to settle in slowly. And yet, for all the sadness, there is hope. That hope is all in Christ. We are all dirty rotten sinners as Dad would say. Our sin has offended a Righteous God. Because of it we all deserve to die. But Christ died in our place. He paid the penalty for our sin. Like He did for Dad, the Lord has opened our eyes to see our sinfulness as He sees it. Dad used to liken himself to a rat running around in the sewer – a vivid description of his sinfulness and our sinfulness. But because Christ has covered this sinfulness with His righteousness, we (like Dad) will one day stand before God and be admitted into Glory. Dad is there now. We look forward to being there in the future. In the meantime, the Lord has work for us to do. This gives us purpose. There is dominion work to attend to. We need to be fruitful. We need to multiply. We need to teach and make disciples. And look after the widows and orphans. May God be praised. His ways are so far above our ways. Though we might experience grief, He comforts us and gives us hope. We remember that those who are in Christ never say goodbye for the last time! remember from the last days of Mr Smith’s life. praise in the earth.” “’Keep not silence’!” Mr Smith repeated. had been able to take a photo! hand and read to him like that. forth much fruit” (v 24). hear. I only put down what I remember. your incredible example of faith, contentment, and Christian grieving. no hope. Actually it was you teaching me about that!